enemy of all." Now, after fifty years, Steinberg speaks for himself. In an unsparing act of self-scrutiny, he traces his passage from artless adolescent to ruthless creature determined to do anything to live. He describes his strategies of survival: the boxing matches he staged for the camp commanders, the English POWs he exploited, the maneuvers and tactics he applied with cold competence. Ultimately, he confirms Levi's judgment: "No doubt he saw straight. I probably was that creature, prepared to use whatever means I had available." But, he asks, "Is it so wrong to survive?" 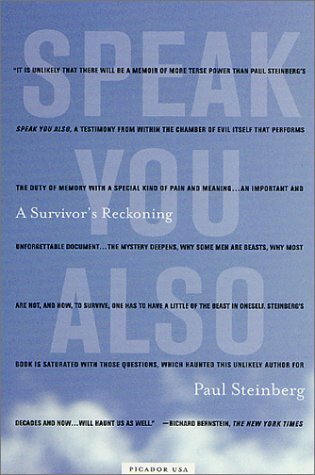 Brave and rare, Speak You Also is a profound and necessary addition to the body of Holocaust writing: a survivor's reckoning with culpability and survival. Stein became associate director of the cardiac catheterization laboratory at Baylor University Hospital in Dallas, and then he became director of the cardiac catheterization laboratory and assistant professor of medicine at Creighton University. Following that he moved to the University of Oklahoma where he was director of the cardiac catheterization laboratory and eventually Professor of Research Medicine. He moved to Henry Ford Hospital in Detroit in 1976, as Director of Cardiovascular Research, and in 1994 became Medical Director of the Henry Ford Cardiac Wellness Center. He was also Professor of Medicine (Henry Ford Hospital) at Case Western University and Adjunct Professor of Physics at Oakland University. Dr. Stein moved to St. Joseph Mercy-Oakland in August 2000. He is presently Professor of Medicine on the Full Time Affiliate Faculty of Wayne State University. He is also Adjunct Professor of Medical Physics at Oakland University.Dr. Stein's major research in recent years has been in the field of venous thromboembolism. Dr. Stein initiated the PIOPED II national collaborative study and is national principal investigator and chairperson of the steering committee. The first edition of "Pulmonary Embolism" was published in 1996.written over 130 articles on pulmonary embolism from among 460 peer reviewed articles. He is a past president of the Laennec Society and of the American College of Chest Physicians. He is also a Fellow of the American Society of Mechanical Engineers, an honor reserved for those who have made a significant contribution to the field of mechanical engineering. He received the Lifetime Achievement Award from the American Heart Association Midwest Affiliate, the Laureate Award of the American College of Physicians, Michigan Chapter and he is a Master Fellow of the American College of Chest Physicians. Linda Coverdale is the awarding-winning translator of many French works and has been honored with the title of Chevalier of the Order of Arts and Letters for her contribution to French literature.